This project is about reenergising an already well functioning but underused area in the historic part of Trondheim. The waterline, its commons, the majestic row of elm trees and the characteristic wooden buildings are all important elements of the urban history. 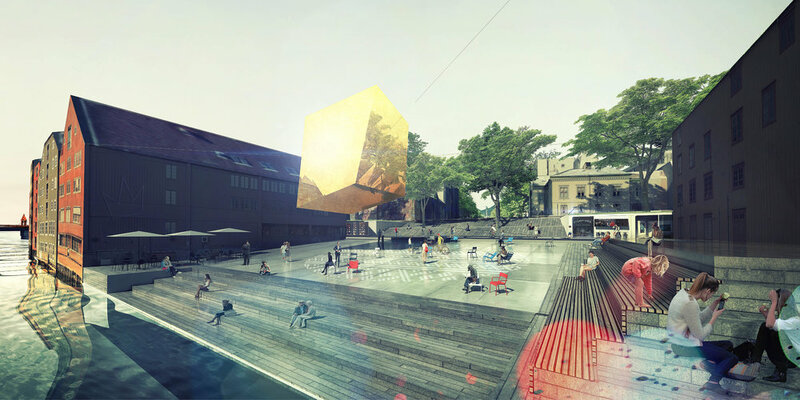 Our proposal contains strategic actions and physical design to make Kjøpmannsgata again a lively and everyday destination for the inhabitants of Trondheim. There are 5 commons along Nidelven that are connected to Kjøpmannsgata. All with different characteristics, none of them living up to their full potential. Looking at water conceptually, we established 5 individual identities for the 5 commons. All identities are based on the local situation, needs of the area, and their historic background. The row of trees following Kjøpmansgata is a historic and important part of the city, but the once generous greenspace has been overthrown by infrastructural demand to facilitate cars. Our concept is to revitalise the green park (vollen), by shuffling and re/arranging the space more efficiently. We use containers (a reference to Trondheim importance as a port city), to lift and even out the slope. With the same strategic move we give Lower Kjøpmannsgata a double sidedness, that makes for a more urban and active situation towards the waterfront. In this project we are introducing a new traffic pattern that allows for more walkability, more cycling and more informal and recreative use of the green and grey space. Looking at the overall driving pattern, we have found a way to reduce unnecessary motorised vehicles in the upper Kjøpmansgata, and to almost completely remove it from the Lower Kjøpmansgata. A lot of excess driving was due to the underground parking space with entrance from the lower street, which we remove by introducing car-park elevators. We also introduce a new delivery system so that the majority of goods can be delivered by bicycle. Overall we have prioritised soft mobility, making it safer, more accessible and more fun to walk and bike.